DB2 processes bound across all processor cores using pbind utility. DB2 processes run in FX class using the priocntl utility. Configured a data link using an aggregation of two network ports using the dladm utility. Set data link port selection policy = L2. The application server was configured to listen on the configured data link aggregation. on the two Sun StorEdge 3320 Arrays. This extrapolates to 6.5 GB storage for a 24 hour run. The database is configured with 1752 GB of storage. Each Sun StorEdge 3320 SCSI Array was configured with a single RAID 1 logical drive. This submission used the xerces implementation 2.6.2 provided with WebLogic 9.2. This result was measured on the Sun Fire T2000. 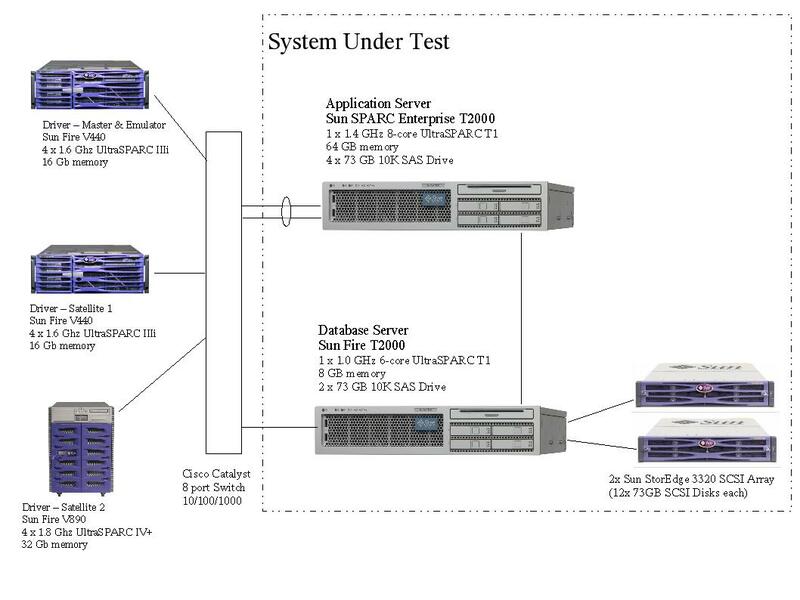 The Sun SPARC Enterprise T2000 and Sun Fire T2000 are electronically equivalent.